Only 15% of people in tech are women. We want to change that. On this brand-new course for 2019, young women aged 14 to 17 can learn the fundamentals of Python – one of the world’s most in-demand programming languages – in an encouraging, inspiring #allGirls learning environment. Led by the expert guidance of our tutors, students will learn about variables, integers, floats, strings, loops, file I/Os and data structures as they tackle their own dynamic project, leaving the course with the confidence they need to use Python independently – and unlocking a world of opportunities in technology. This is a beginner’s course, but it’s perfect for anyone that wants to go back and master the basics – making it a top choice for GCSE or A-Level Computer Science students. Whether you want to work at Google, create the next Facebook or shape the landscape of artificial intelligence, at Fire Tech the future of tech is at your fingertips. Girls make up 28% of students at Fire Tech, which is twice the national average – but not high enough. Lots of girls love creating with tech, and we know even more would love it if they had the chance. But, sometimes, teens are concerned they might be the only girl in their class. 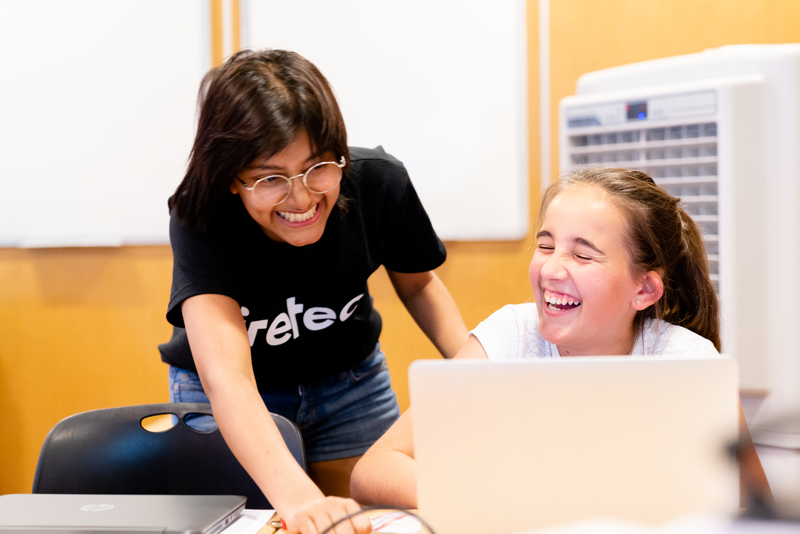 That’s why we’re offering all-girl classes, usually led by a young, female instructor – so all girls can work, play and be inspired by tech, in an environment that supports and encourages them. An #allGirls class, so that #allGirls feel welcome. NB: Please note that while the intention is to create a very girl-friendly atmosphere, we could accept boys or non-binary students in this programme on a case by case basis.